Destroy Athens tells a story. The story emerged from a completely empirical observation. We, each one of us, the subject of every action and every conscience is built through the eyes of others. 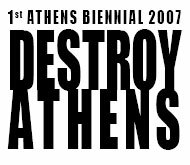 Destroy Athens tells a story. The story emerged from a completely empirical observation. We, each one of us, the subject of every action and every conscience is built through the eyes of others. What is important here is that it is not being constructed by others – it is all an internal affair: the subject builds its own self, but its building material is the perception of others. And this fact is the precondition of any recognition, collectivity, connection, participation, sense of community. This precondition is a necessity, but at the same time that the subject feels it, lives it and depends on it, it will never accept it. One could put it like this: we never want to be what we are; we claim the right not to be what we are. Under certain conditions, both unexpected and intricate, between those two dimensions of the entirely consubstantial – there is no division of any kind – subject, there is a rupture. What is more, such rupture is not exactly a symptom of a contradiction, but an element of our very constitution. Apparent or latent, the rupture is potentially there, lurking in the possibility of claiming refusal: at every instant, we are entitled to deny the precondition of collectivity and abolish any connection or relationship. How would we be able, we wondered, to construct a story in which one faces such an observation? It is true that, trying to do so, we went through at least two stages. In the beginning we created a booklet, Suggestions for the destruction of Athens, in an effort to construct a narrative grid and a treasure hive of ideas on the exhibition. Then, following up this narrative grid, we organized a conference, proposing the discussion of the incentives suggested by our early concept. The conference, titled Prayer for (Passive?) Resistance, lead to a second book. In the introduction, while explaining the thought-process of the two stages that would lead to the third one, namely the structure of the exhibition, we wrote: it is not our aim to draft a navigational map or construct a compass for the bewildered viewers of an exhibition; we would like the exhibition to remain off the edge of the map – where there be monsters. So, in a way, our preparation was not so much to load even more duties onto the back of the exhibition, but to lay down those that were already troubling us. We tried to get rid of any guilt-ridden tendency to offer up some field for the representation of ideas, any implied obligation to pursue a quasi-scientific method, anything that might hinder story-telling, that might force us to keep only one tone of voice, that might diminish our ability to shout or whisper. As the place where the story unfolds we chose Athens; at first perhaps for the obvious reason that we live here. However, we are in a way fortunate as Athens is in itself an appropriate emblem for what we termed a stereotype, throughout the long period that the story was being shaped, that is the sense of extra-determination which constitutes the extreme expression of the subject’s self-construction we mentioned before. Perhaps a different city could have been employed – and not just Rome or Istanbul, but also Louisville, Nairobi, Peshawar or Volos. Every place, every sense of historicity, every background, every nationalist or cultural construct, any political formation, either individual or collective, is equally vulnerable to the identity that is built through the eyes of others. But if we see Athens as the location where the story evolves, one is obliged to accept the inevitable – and merciful – degree of arbitrariness of any story: if the story took place in London, it would probably be raining, but then what happened after that would still be the important thing. And that’s what is great about a story: nothing is binding, yet everything is specific. One thing or another could happen elsewhere or differently, but it is happening here and it is happening like this. It would not of course be hard to find in contemporary art – and elsewhere – attempts to dissert on the observation we mentioned above. We wondered, however, repeatedly during the preparation period, if to dissert on it – a practice which is often, rather hastily, called political – wasn’t in reality a way not to accept the possibility of abolishing consent, to pretend that no rupture exists even at the very moment where one unabashedly proclaims it, a way for some optimism to creep in, a feeling that it’s all going to be alright. A story, though, is not a dissertation. A story may be a story about a rupture in the same way that it can be a story about anything. A story is something which happens to a subject, to a potential “someone”. A story can face the question: what if all is not going to be alright? What if someone decides to try their luck, to raise their voice, to engage in conflict, to abolish consent, to destroy Athens? Let us, then, come to the monsters. The story is divided in six chapters. Its dramaturgy follows a method of constant shifts, where a position is built for a time and is then either twisted towards something else or broken down. The narrative is linear but syncopated, so that from chapter to chapter the atmosphere changes radically. Destroy Athens is then structured as a story also in terms of space. It is a course in space, which allows for a specific continuity and therefore a reading. We have no way of knowing – being by now totally immersed in our story – how strange it might seem from the outside that we decided to tell a story of ruptures and dead-ends. What is certain is that our lives are full of images of violent conflicts, huge disasters and almost constant brutality. At the same time, in the context of public discourse, all this is banished to the sphere of the abnormal, the illogical, or plainly the deviant: even when it is not happening somewhere else or to others, it happens as a deviation from normality, in spite of logic, in the margins of our correct and rational world. We feel that this persistent effort to present any rupture, any violence and any deadlock as something that should not exist, as something that does not belong to the constitution of the world and of the subjects that inhabit it, is perhaps the greatest lie of our time. f there is something that Destroy Athens is not, then it is not a survey. It does not aim at being a barometer of artistic production at this moment nor teach anybody what is significant today in contemporary art or in the geopolitical circumstances. It does not want to express an opinion about what is important, poignant, interventional or new, it does not wish to argue in favour of a practice or against another, it does not wish to predict where things are heading right now or where they will be tomorrow. It is a story. We do hope that as a story it has meaning between the moment it begins and the moment it ends.